Over its 36 years, Native Sun® has made many friends and forged many strategic business alliances. One such friend is Mike Ryan, a longtime friend, angler and business associate of Mitcheson's from Bradenton, FL, who sports an impressive pedigree in casual sportswear, retailing and "for retail" apparel. One day in April of '05 while discussing college T-shirt graphics and designs, the conversation turned to Fishing Designs. When Ryan suggested what he felt was a new and viable direction in fishing graphics and accessories, Mitcheson said, "Let's do it"...and the idea for GetReel...GetFish!™ was hatched. GetReel...GetFish's tagline of "Bare Bones Fishing Gear" is mirrored in the strikingly fresh, simple and appealing graphics of skeletal designs from sportfishing. Mike and George have expanded the line out from Florida, providing attractive graphics of interest to the extended geographic boundaries the Get Reel...Get Fish!™ brand is now beginning to reach. We sincerely hope that we are able to count you as one of our deeply appreciated and well-satisfied customers. THANK YOU! for allowing us this opportunity. 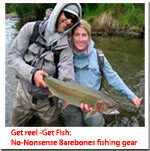 NATIVE SUN SPORTS SPUN OFF GET REEL... GET FISH! BRAND AND IT BECAME GET REEL... GET FISH!, LLC UNDER NEW OWNERSHIP. THE NEW OWNERSHIP PROMISES TO CONTINUE TO PROVIDE QUALITY FISHING APPAREL AND ACCESORIES TO THE FISHING COMMUNITY. WE LOVE TO BE ON THE WATER; FISHING, BOATING, SAILING, BEACHING OR JUST HANGING OUT. FRESH WATER OR SALTWATER WE JUST WANT TO BE AS CLOSE TO IT AS WE CAN BE. IF YOU SHARE OUR PASSION FOR BEING OUTDOORS AND ON THE WATER, I AM SURE YOU WILL LIKE OUR PRODUCTS. I HOPE TO SEE YOU ON THE WATER SOON!